I am amazed at the useful little things you can find out without even trying too hard. 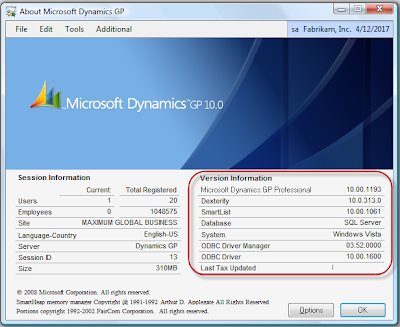 Many times I ask users to provide me with the build number of their Dynamics GP dictionary or SmartList dictionary and, whether because of lack of familiarity with the product or simply the amount of information found around the Dynamics GP application set, this task can become a bit confusing. Typically, you would click on Help > About Microsoft Dynamics GP to access dictionary build numbers under the About window, as shown in this picture. Often, we come across a situation where we get into developing a customization on a version which may not be compatible with the version installed at the client site. This may not be that big a problem if it was developed without any alternate windows and reports, since in that case, recompilng the code on a fresh DYNAMICS dictionary would be more than sufficient in most situations.